Inequality Questions for SBI Clerk, Syndicate PO, SBI PO, Insurance. 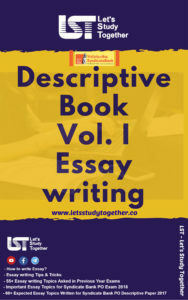 Welcome to the www.letsstudytogether.co online Reasoning section. If you are preparing for SBI Clerk, Syndicate PO, and Canara PO exams 2017-18, you will come across a section on Reasoning Ability Section. Here we are providing you with Reasoning quiz “Inequality Questions for SBI Clerk Prelims ” based on the latest pattern for your daily practice. This “Inequality Questions for SBI Clerk, Syndicate PO 2018 “ is also important for other banking exams such as SBI PO, IBPS Clerk, SBI Clerk, IBPS RRB Officer, IBPS RRB Office Assistant, IBPS SO, SBI SO and other competitive exams. 1.In the given questions, assuming the given statements to be true. Find which of the given four conclusions numbered I, II, III and IV is/are definitely true and give your answer accordingly. A Only I, II and III are true. C Only I and II are true. D Only I and either II or IV are true. E All I, II, III and IV are true. A. Only I, II and III are true. 2.In the given questions, assuming the given statements to be true. Find which of the given four conclusions numbered I, II, III and IV is/are definitely true and give your answer accordingly. A Only either II or III is true. B Only either II or III is true. C Only IV is true. D Only II is true. E Only III is true. 3.In the given questions, assuming the given statements to be true. Find which of the given four conclusions numbered I, II, III and IV is/are definitely true and give your answer accordingly. A Only II is true. B Only I and III are true. 4.In the given questions, assuming the given statements to be true. Find which of the given four conclusions numbered I, II, III and IV is/are definitely true and give your answer accordingly. A Only I is true. B Only II is true. C Only III is true. E Only I and IV are true. 5.In the given questions, assuming the given statements to be true. Find which of the given four conclusions numbered I, II, III and IV is/are definitely true and give your answer accordingly. D Only II and IV are true. E Only I and II are true. 6.In each question, three statements showing relationships have been given, which are followed by two conclusions I & II. 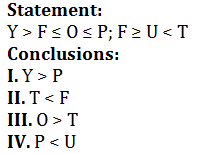 Assuming that the given statements are true, find out which conclusions is/are definitely true. 7.In each question, three statements showing relationships have been given, which are followed by two conclusions I & II. 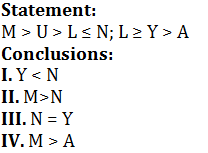 Assuming that the given statements are true, find out which conclusions is/are definitely true. 8.In each question, three statements showing relationships have been given, which are followed by two conclusions I & II. 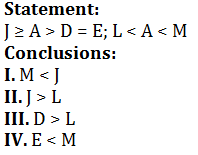 Assuming that the given statements are true, find out which conclusions is/are definitely true. 9.In each question, three statements showing relationships have been given, which are followed by two conclusions I & II. 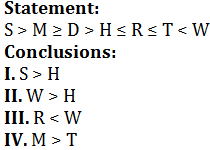 Assuming that the given statements are true, find out which conclusions is/are definitely true. 10.In each question, three statements showing relationships have been given, which are followed by two conclusions I & II. 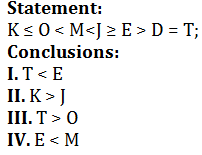 Assuming that the given statements are true, find out which conclusions is/are definitely true.